I am so disheartened by educational funding in this country. It devastates me that states and communities continue to divest in education. California has a $6.1 billion surplus, yet we (the California State University system – CSU) are looking at a 3-4.5% budget cut. The governor is proposing to fund us (the 23 universities in the CSU) just under $171 million less than requested. After being cut by $1 billion during the recession between 2008-2012, we are just now at the funding level we were at in prior to that cut in 2007. And we are educating 50,000 more students (across 23 universities) than we were 10 years ago. And, as I mentioned before, our staff and faculty unions negotiated three-year tiered raises that are much deserved, but have not been funded. I DO NOT UNDERSTAND. The most short-sighted piece of the underfunding is the impact on the economy. When we have budget cuts, then we don’t fill vacant positions or create new ones. Those are jobs that are sitting empty because we can’t afford the salary. I am not filling two of my direct reports so that our office can use the salary savings in the cut. Those are two good jobs that won’t be available. Because California does things backwards, we hire fewer faculty which ultimately means we turn away more qualified students. And those students who are denied entry to the CSU or UC are leaving California in droves. My campus turns away about 3,000 QUALIFIED students each year because we are not allowed to grow and don’t have the faculty to teach them. THREE THOUSAND. The CSU was created to serve the citizens of this state, and we can’t. That is just crazy to me. 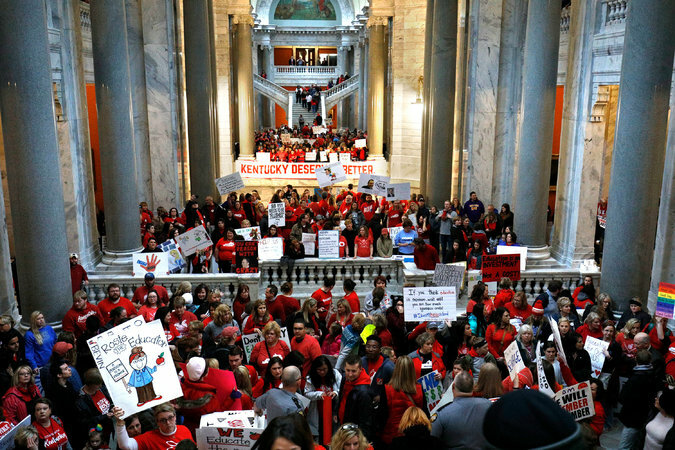 I also feel devastated for the teachers who have been forced to walk out in Oklahoma and Kentucky because of funding failures by their states. It is immoral that as a society we continue to pay teachers (and other public servants for that matter) such a pittance. Being a teacher is HARD (which is why I didn’t continue teaching after one year). It was emotionally and mentally exhausting every day. They are raising your children for a big chunk of the day. Politically, it pains me to see the disconnect between people wanting lower and lower taxes (no one likes paying taxes) yet demanding increased funding for public programs. Public education is an entitlement. I believe that the fact that every child in this country (citizen or not) can enroll in our school system without paying tuition is something that makes our country truly great. I see my friends state how much they love the quality of the public schools in their community, then go on to complain about property taxes. Property taxes pay for those great schools. And while I have my own issues with too much reliance on local taxes for funding education (property poor communities get screwed hard), the money for schools comes from taxes – whether they are local, state, or federal. Education isn’t cheap and there is no profit. We don’t sell the product at the end. Paying fewer taxes will ultimately result in a continued divestment in education. To me, it is extremely telling about our values as a society that so many continue to make decisions and vote for people who defund our educational system. We can give the wealthy increased tax breaks, but we can’t get our schools enough funding to pay teachers a livable wage and buy toilet paper?? SERIOUSLY. RAGE. Our teachers and students deserve so much better. On to another education topics, I’m sure I’ve mentioned this before, but I wrote my dissertation on international education. The opportunity for students (around the world) to travel abroad and have a fulfilling experience is something I am passionate about. I believe that exploring new cultures and places generally changes us in positive ways, and I want all students to have access and opportunity to learn in a new country. The ICEF released their report recently that F-1 visas (visas issued to international students who wish to study in the United States) were down 17%. That is devastating in terms of educational opportunity, but it’s also bad for the economy. Those students come here and spend money. A lot of them stay and work here where they will pay taxes and continue contributing to the economy. As noted in the report, a lot of institutions rely on the tuition paid by intentional students and they are being hit hard by these drops – particularly those in the Midwest. THIS IS NOT MAKING AMERICA GREAT.